Blog Korea! Visit Korea! ~ Philippine Freebies, Promos, Contests and MORE! If you can't stop blogging about Korea then this contest is for you. Join in Blog Korea! Visit Korea! contest. Blog about Korea's landscape, culture, cuisine, and travel in your personal blog and be one of the top 100 most active and popular blogs to get laptops, digicams and mp3 players. 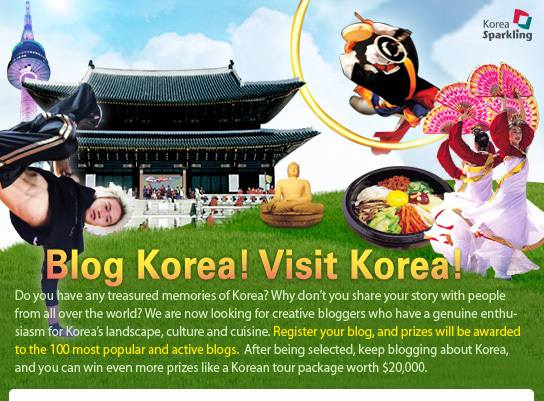 Keep on writing about Korea and you may also be one of 30 bloggers to win a trip to Korea!